Many health service organizations deploy first responders and health care professionals to mass gatherings to assess and manage injuries and illnesses. Patient presentation rates (PPRs) to on-site health services at a mass gathering range from 0.48-170 per 10,000 participants. Transport to hospital rates (TTHRs) range from 0.035-15 per 10,000 participants. 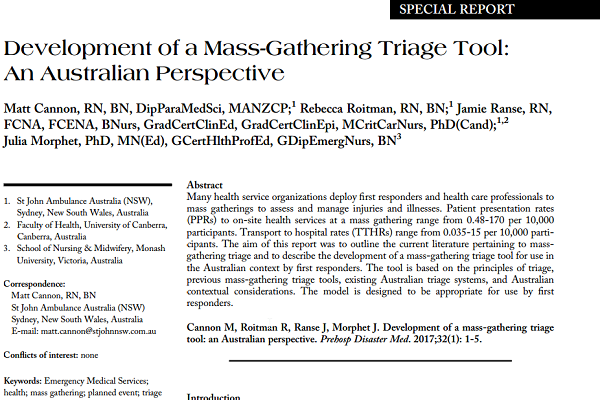 The aim of this report was to outline the current literature pertaining to mass-gathering triage and to describe the development of a mass-gathering triage tool for use in the Australian context by first responders. 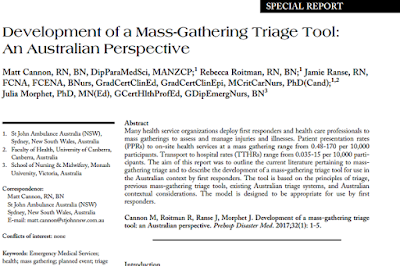 The tool is based on the principles of triage, previous mass-gathering triage tools, existing Australian triage systems, and Australian contextual considerations. The model is designed to be appropriate for use by first responders.